I'm Chris Shattuck and this is Development Tips and Tricks". In this video, we're going to talk about some commonly used utility functions. We'll discuss and compare different integrated development environments. And we'll talk about strategies for avoiding creating a module that already exists. We're going to start by looking at several utility functions supplied by Drupal, and their functions, a few of which that we've looked at already in previous videos, including the "t" function, and "variable_set" and "variable_get", but we're going to go through them in greater detail and then we're going to add a few more and see how they all work together in a module. So, to start, go ahead and open up the tips folder inside of your "buildamodule" resource directory and copy this. 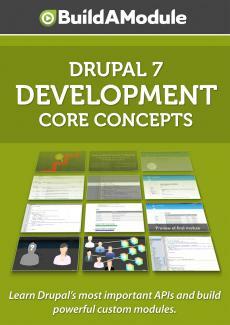 And we're going to paste it into our Drupal 7 site in sites, all, modules, custom. Ok. Now this module includes several pages.